MSM fast became our number one best seller since our customers discovered how well it helps maintain healthy, flexible joints and muscles. Higher Nature MSM is sourced from tree bark; most companies supply petrochemical MSM. MSM or methyl sulphonyl methane, is a sulphur compound that occurs naturally in our bodies and in our most common foods. Sulphur is found in all body cells, and in many amino acids, vitamins, enzymes and hormones. Sulphur in the form of MSM is needed for the formation of collagen, which is the fibrous substance in connective tissue. Sulphur is therefore essential for the production of cartilaginous tissue whose elasticity is especially suited to provide support to the body. Sulphur is a significant constituent of skin, hair and nails, and has been called the `beauty mineral`. Sulphur levels in our tissues are known to vary for a number of reasons. 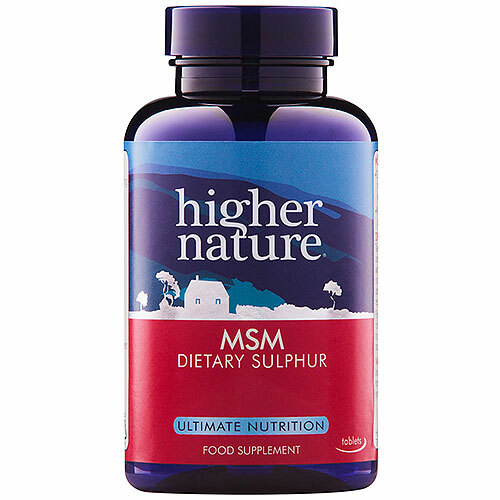 Daily MSM use provides a natural and easily absorbed source of sulphur. CONTAINS NO added sugar, salt, wheat, gluten, yeast, lactose, dairy products, artificial preservatives, colours or flavourings. MSM (Methyl Sulphonyl Methane). Tableted with natural ingredients; natural Lithothamnion calcarea, bulking agent: microcrystalline cellulose,hypromellose coating (glycerine), anti-caking agents: silicon dioxide, vegetable magnesium stearate. Adults: Take 1-6 tablets a day with meals, building gradually or as a health professional advises. Children over 8 years: Take 1 tablet a day with meals. A daily multivitamin and vitamin C are also recommended. MSM has an initial laxative effect on the body. Drink plenty of water. Reduce intake if detox symptoms are uncomfortable. Below are reviews of MSM - Sulphur - 180 x 1000mg Tablets by bodykind customers. If you have tried this product we'd love to hear what you think so please leave a review. 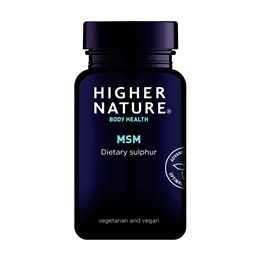 I haven't been able to up my intake of these MSM supplements because I find they are quite hard on the liver, so at 1000mg a day I haven't seen any notable benefits. MSM is a number one bestseller because it helps maintain healthy, flexible joints and muscles. MSM is also good for maintaining strong hair and nails, and beautiful skin.